If you're on the hunt for a casual yet absolutely stylish getup, wear an Asos Petite Petite Velvet Puffer Jacket with a black mini skirt. As well as super comfortable, these items look incredible when worn together. Kick up the cool of your ensemble by finishing off with black leather ankle boots. 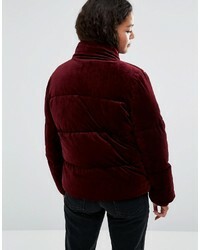 Opt for an Asos Petite Petite Velvet Puffer Jacket and navy skinny jeans to be both cool and relaxed. Wearing a pair of brown suede ankle boots is a simple way to add some flair to your look. If you're on the hunt for a casual yet totaly stylish ensemble, wear an Asos Petite Petite Velvet Puffer Jacket from Asos with a black and white horizontal striped sweater dress. As well as super comfy, these garments look amazing paired together. Got bored with this outfit? Enter black leather over the knee boots to switch things up. We're all ensembleing for comfort when it comes to dressing up, and this combination of an Asos Petite Petite Velvet Puffer Jacket from Asos and blue ripped jeans is a great example of that. 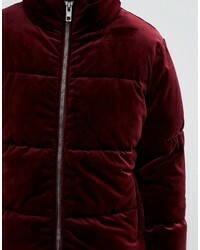 If you're searching for a casual yet incredibly stylish look, try teaming an Asos burgundy jacket with burgundy skinny jeans. Both of these items are very comfy and look stunning when paired together. Make your getup more fun by finishing off with burgundy high top sneakers. We all seek comfort when it comes to dressing up, and this combination of a burgundy jacket and charcoal ripped skinny jeans is a great illustration of that. For the maximum chicness rock a pair of white canvas low top sneakers. If you're obsessed with relaxed dressing when it comes to your personal style, you'll love this stylish combo of a burgundy jacket and black ripped skinny jeans. Wearing a pair of black suede ankle boots is an easy way to add some flair to your getup. 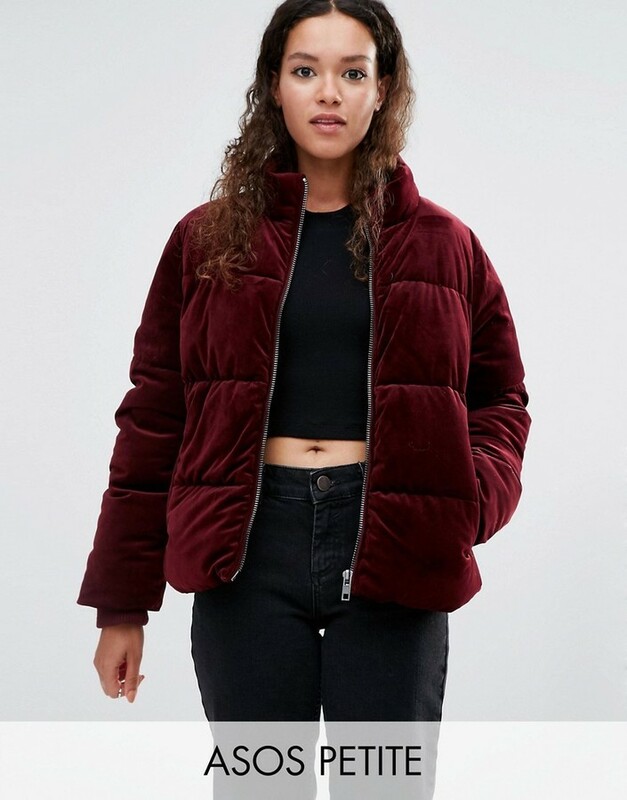 Consider wearing an Asos Petite Petite Velvet Puffer Jacket and charcoal ripped skinny jeans to be both killer and relaxed. Round off with black leather gladiator sandals and off you go looking gorgeous. If you're obsessed with functionality dressing when it comes to your personal style, you'll love this absolutely stylish pairing of an Asos Petite Petite Velvet Puffer Jacket from Asos and a blue print playsuit. Let's make a bit more effort now and throw in a pair of brown leopard suede pumps.